Enterprises look more and more to business intelligence (BI) to gain a competitive edge. Today's BI systems incorporate large data warehouses that are consolidated with near real-time operational data stores (ODS) and continuously updated from multiple sources. An increasing number of users in the enterprise want to access the data warehouse with BI applications with real-time needs. 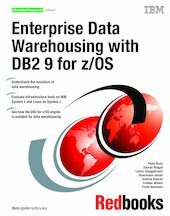 There is a renewed interest in the ability to implement a data warehouse solution on DB2® for z/OS® and System z™. This is due to the inherent characteristics of security, availability, performance, mixed workload management, and the growing portfolio of data warehousing tools and functions provided by IBM®. In this IBM Redbooks® publication, we focus on today's software components on System z and show how you can use them to realize the infrastructure for a full data warehouse solution. By using a retail business scenario loosely based on the TPC-H benchmark, we guide you through the warehouse implementation steps. In addition, we highlight the available methods, techniques, and technologies for the deployment of this solution, including reporting and analysis with Cognos 8 BI. This book provides an opportunity for you to look at satisfying the operational needs of corporate users in addition to the longer term needs. In addition, business decision makers, architects, implementors, DBAs, and data acquisition specialists can use this book to gain a better understanding of how a data warehouse can be designed, implemented, and used.